The snowpack in the vast Upper Colorado River Basin—encompassing almost 110,000 square miles of mountains, valleys and tributaries from Wyoming to New Mexico—hit its seasonal peak this month, federal data show. It reached about 94 percent of the long-term average. But the melted snow that makes it into the river and eventually to Lake Powell in Utah, the second-largest reservoir in the nation, is expected to reach only 74 percent of average, forecasters say. The Colorado River serves people and about 6,300 square miles of farmland in Arizona, California, Colorado, Nevada, New Mexico, Utah and Wyoming. Mexico also is entitled to a share. Water users and managers watch the Upper Basin closely, especially in April, when the snow usually reaches its deepest levels and begins to melt into the Colorado River or its tributaries. 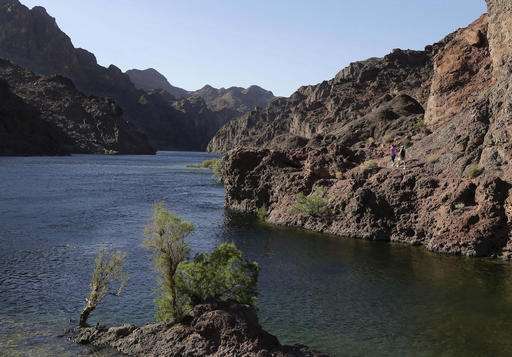 A dry fall and early winter reduced soil moisture in the basin, said Malcolm Wilson of the U.S. Bureau of Reclamation, which manages Lake Powell and hundreds of other reservoirs. "When you have dry soil, the first place the water goes is to recharge that soil," he said. Lake Powell, behind the 580-foot-high Glen Canyon Dam, helps the Bureau of Reclamation regulate the river and distribute its water. The reservoir serves as a kind of savings account for the Upper Basin states—Colorado, New Mexico, Utah and Wyoming—storing up water during wet years to ensure they have enough to send to the Lower Basin states, even in dry years. Powell is about 45 percent full amid a long-term drought, but that should provide a big enough cushion that Lower Basin states—Arizona, California and Nevada—can get their share for the foreseeable future without requiring the Upper Basin to cut back, Wilson said. "We're in a pretty reasonable spot," he said. The lake was expected to rise 16 feet from this spring's snowmelt, Wilson said. Comparing years can be difficult because the canyon that forms the lake is V-shaped, so the higher the water level, the more water it takes to raise it another foot. Although the snowpack is near average across the Upper Colorado River Basin, it varies widely within the region, from 110 percent in parts of Colorado to 61 percent in south-central Utah. Consider the western tradition is to hold & control water release, an Andean technique is insightful as some of their canals used porous rocks. The purpose was to provide groundwater for miles of valley-floor agriculture not for drinking. Consider that holding water in dams is not natural, it ends floods which are needed to move nutrients-sediments around and raises the water-table adding to groundwater over large areas of riverine habit. For the long-term you can't do that, it forces ranches to pump water for crops on flood terraces versus dryland farming it across much of the Western USA from the loss in water-table below dams. What we're doing allows too much evaporation & leak losses as a system, not enough of waterways are covered, water is allowed to heat up too much other critiques.